Home / Stencil Ideas / Before + After / Rattan Stenciled Table Top by Bari J.! Royal Design Studio has partnered with fantastic stencil designers to bring an ever-expanding array of beautiful stencil pattern options. One of these designers is Bari Ackerman of Bari J., a well-known pattern designer in craft and sewing circles who has created multiple fabric lines for the boutique fabric company Art Gallery Fabrics. Her Bari J. Stencil Collection includes patterns for walls, furniture, fabric and more with her vintage-modern aesthetic! Bari recently used one of her own patterns, the Small Rattan Wallpaper Bari J Stencil, to spruce up her coffee table! Bari had been planning for months to do a little something with her coffee table, which had a brown stained finish. She sanded the finish down a bit to give it a bit of “tooth” and followed that up with both primer and three full coats of white spray paint. To stencil the rattan pattern, she used a stencil brush with a gray-blue latex paint color. When fully dry, she added full coverage of a topcoat. “I plan on having a piece of glass cut for the top of the table so I don’t have to yell at people about coasters, but I do think it would be fine to leave it like this too”, she further shares. That’s it! It’s super easy to stencil a table top and fun, too! Plus, you can’t beat the results of this stenciled table — so fresh, contemporary and bright! 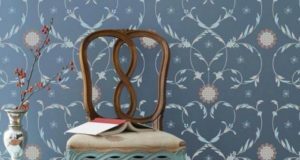 Of course, if you’d like to stencil a larger surface, such as a wall, floor or ceiling, the Large Rattan Wallpaper Bari J. Stencilwould be ideal. You can catch Bari’s full project process in her Stenciled Coffee Table Makeover blog post and see other ideas to top off a table with stencils. We love to see stencil projects by our very own stencil designers AND you so be sure to send them in to projects(at)royaldesignstudio.com or share them on our Facebook page!